At the time of his arrest, Andrew Sweeney was out on bail from a prior drug charge. LIMINGTON – A bail compliance check on a suspect charged with drug possession in January resulted in the discovery of a methamphetamine lab and the arrest of the man police believe was making the drug. 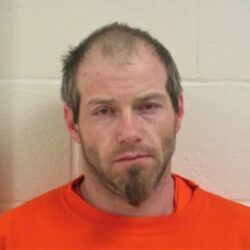 Andrew Sweeney, 33, of Hemlock Lane was taken into custody without incident on Thursday. He is charged with operating a methamphetamine lab, a Class B felony. York County Sheriff’s Office deputies were checking on Sweeney as part of his bail conditions on Wednesday when they recognized several items consistent with a meth lab inside Sweeney’s mobile home. They secured the scene, and contacted the Maine Drug Enforcement Agency for assistance, said Maine Public Safety spokesman Steve McCausland. The Maine Drug Enforcement Agency and the Department of Environmental Protection haz-mat team spent Thursday dismantling a Limington methamphetamine lab. York County Sheriff’s deputies spotted items consistent with the drug’s manufacture when they were conducting a bail check Wednesday on an individual previously charged with drug possession. Methamphetamine is typically made from household ingredients that form a chemical reaction inside a plastic soda bottle. The state Environmental Protection Agency also responded to take custody of the chemicals and its by-products seized from the scene, McCausland explained. Sweeney was transported to York County Jail, where he is held without bail. He is scheduled to make a first court appearance later today. McCausland said the discovery at Sweeney’s mobile home is the third meth lab incident MDEA has responded to this year. The MDEA responded to 52 meth lab related incidents in 2018. A person convicted of a Class B felony could be sentenced to as much as 10 years in prison. According to the U.S. Department of Justice, the chemicals used to produce methamphetamine are extremely hazardous. Some are highly volatile and may ignite or explode if mixed or stored improperly, according to information on the DOJ website. Fire and explosion pose risks not only to the individuals producing the drug but also to anyone in the surrounding area. Even when fire or explosion does not occur, methamphetamine production is dangerous. Simply being exposed to the toxic chemicals used to produce the drug poses a variety of health risks, including intoxication, dizziness, nausea, disorientation, lack of coordination, pulmonary edema, serious respiratory problems, severe chemical burns, and damage to internal organs, according to the justice department.